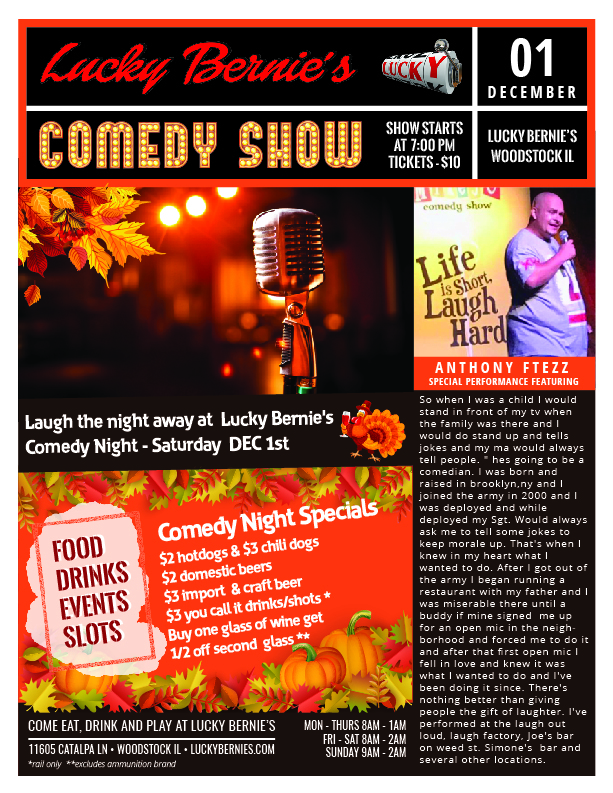 Come in and laugh with the Lucky Bernies team!! $10 Tickets. So when I was a child I would stand in front of my tv when the family was there and I would do stand up and tells jokes and my ma would always tell people. ” he’s going to be a comedian. I was born and raised in Brooklyn and I joined the army in 2000 and I was deployed and while deployed my Sgt. Would always ask me to tell some jokes to keep morale up. That’s when I knew in my heart what I wanted to do. After I got out of the army I began running a restaurant with my father and I was miserable there until a buddy if mine signed me up for an open mic in the neighborhood and forced me to do it and after that first open mic I fell in love and knew it was what I wanted to do and I’ve been doing it since. There’s nothing better than giving people the gift of laughter. I’ve performed at the laugh out loud, laugh factory, Joe’s bar on weed st. Simone’s bar and several other locations.